A specific range of professional treatments - very effective. Controls algae and blanket weed by filtering out light. Restricts growth using a UV screening, faint blue dye. 250ml, treats 14000l. Koi Calm is a gentle sedative designed to calm the fish down so that it can be handled easily for topical application of Ulcer Swab and Wound Seal, or for movement or close inspection. Using NT Labs Koi Care Koi Calm helps to slow the fish down, reduce stress and allow inspection and repair work to be carried out. Wildlife friendly & all fish safe! NT Labs Pond Eradick controls parasites such as White Spot, Trichodina, Costia and Fungus on fish. Use daily over 5 consecutive days as a full course of treatment. Safe for all pond fish. Use a double dose to treat parasites as well as bacteria. NT Labs Koi Care Permanganate is an excellent bath treatment for ulcers, parasites and all infections @ 10ppm dose (10 ml/40 litres - 30 mins). Can also be used for general cleaning of pond water and reducing chemical oxygen demand @ 1ppm dose rate (10 ml to 400 litres). As a treatment to the whole pond, dose at 2ppm (10 ml to 200 litres). The dosage calculator will only calculate a full pond water dose 2ppm level and should not be used for calculating baths 10ppm . 250 ml treats 5,000 litres (1100 gallons) at the 2 ppm pond cleaning treatment dose. When Permanganate comes into contact with organic material, it breaks down and becomes ineffective as a treatment. To remain effective, the water must remain pink for 10 - 12 hours. If the water becomes brown, the Permanganate is no longer working. Add more, bit by bit, until the water remains pink. This is the reason that permanganate is best used as a bath with clean water which will remain active for the full duration of the treatment. Foamclear is designed to break down the froth in garden ponds, created by an excessive build up of protein in the pond water. The more protein that is present the larger the amount of foam. Foamclear will breakdown the froth, allowing carbon dioxide to escape from the water and helping to maintain the correct pH. Foamclear is non toxic, harmless to plants, harmless to all fish and other aquatic life and does not affect bacterial filters. Controls algae and blanket weed by filtering out light. Restricts growth using a UV screening, faint blue dye. 250ml, treats 28000l. Pure high-grade ultra fine powdered montmorillonite revitaliser clay. NT Labs Koi Care Mediclay controls the waste build up of bacteria, algae and pollutants in favour of nitrifiers. Clears water, improves health, appetite and reduces algae in Koi ponds. Use weekly to keep the water crystal clear or daily when fish are sickly or recovering from disease. Can be used with salt in the water and at any temperature. Do not use while treating the pond with a medication. 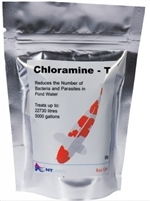 Does not remove chlorine, use dechlorinators at the same time if required when topping up. A mild antiseptic, useful as a quarantine solution to treat fin-rot and ulcers. NT Labs Koi Care Acriflavin is best used in conjunction with Ulcer-Swab and Wound Seal in the treatment of ulcers and other open wounds. For a crystal clear pond. Flocculates particles in water assisting filtration and improving water clarity rapidly. Harmless to fish and plants. Take care not to use in muggy, hot weather or when oxygen levels are low. Follow the guidelines. Provides minerals for growth, metabolism and other cellular processes. 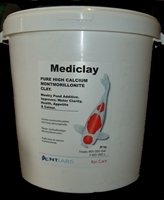 General hardness minerals such as calcium and magnesium are essential for aquatic biological functions. Such minerals are used in fish growth, metabolism and other physiological functions. General hardness minerals can decrease over time due to influx of rainwater, soft tap water and biological processes using these minerals. 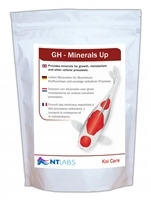 NT Labs ‘GH – Minerals Up’ safely increases the GH providing an optimal habitat for your fish and other pond life. Anti-Parasite and Fungus Mixture of Malachite Green and Formalin formulated for treating sick Koi with a parasite or fungus infection. FMG provides the same treatment levels as the two individual components used separately. A ready mixed Koi treatment eliminating the need to mix separate treatments, the treatment levels are higher than other proprietary mixtures which means this product should not be used when sensitive fish such as Golden Orfe or Sturgeon are present. FMG can be used where Goldfish are present. The market leading Koi anti-parasite and fungus treatment for Koi. There is nothing else on the market as effective as FMG to fight unwanted parasites. A Koi keepers secret weapon! Note: The warnings on the label and handle the product with care.